1 sachet = 3 grams dehydrated milk kefir grains represents 20 grams of fresh kefir grains. Milk kefir is also known as dairy kefir, a fermented milk beverage. Milk kefir grains are also know as Tibetan mushrooms, yogurt plant or yogurt fungus. Dried milk kefir grains are gained from live milk kefir grains. After activating the dehydrated kefir grains in milk, you'll have live milk kefir grains. We advise NOT to buy live kefir grains when the local temperature reaches +27°C, while shipping live kefir grains can be damaged. We DO advise to buy dehydrated kefir grains instead. Make your own milk kefir at home. Homemade kefir is tasty and healthy! Dehydrated milk kefir grains have the same characteristics as the live, reusable milk kefir grains. Dehydrated kefir grains need to be activated in dairy milk for 4 - 7 days before regular use. 3 grams of dried milk kefir grains are obtained from 20 grams of live milk kefir grains. After activating the milk kefir grains you can start with the regular instruction "How to make Milk Kefir". Add the kefir grains to fresh milk and after about 24 hours you have a delicious probiotic drink. Milk kefir can simply be drunk or flavored with sugar, fresh fruit. It is recommended to refresh the milk daily. 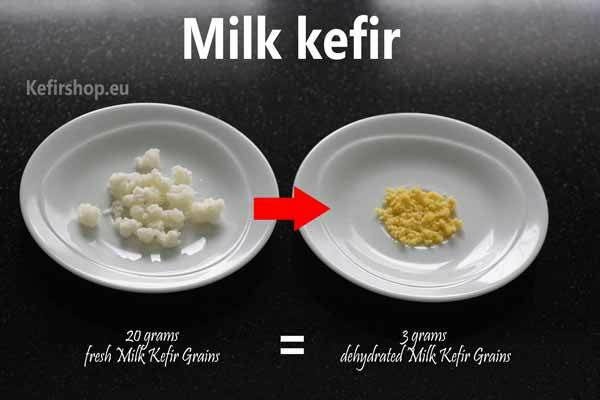 Milk kefir is made at room temperature, high temperatures or heating can kill the kefir grains. NOW, you can now use the usual instruction "How to make Milk Kefir"
If you're having trouble making milk kefir, take a look at our FAQ's. Please do not hesitate to contact us if you do not find an answer in this list. Milk kefir grains, kefir plant, yogurt plant, kefir flowers.